Located on the desirable Kohala Coast in the upscale Mauna Lani resort we welcome you to the Golf Villas at Mauna Lani. 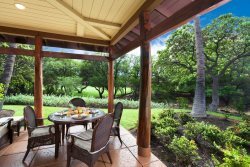 Situated on the south course of the Mauna Lani Golf Course you will enjoy beautiful sunsets from the lanais of this home. Spacious living room with vaulted ceilings and large windows for plenty of natural light. Unit offers two lanais, both overlooking the crisp green colors for the golf course, lava rock, and the multi-million-dollar homes just across the fairways. There is an electric gill on the lanai. Unit includes garage use and a second parking spot across from the unit. Just a short walk from the popular black sand beach and Includes access to the Mauna Lani Beach Club. This 3 bedroom, 3 bath townhome has the master suite upstairs with a California King Bed with attached bathroom, walk-in shower, soaking tub and lanai off the master bedroom. Junior guest suite upstairs has two twin beds and attached bathroom with tub shower. The loft area has a queen sleeper sofa to accommodate 2 additional guests. Downstairs is a guestroom with a queen bed, full bath just steps from the bedroom. Laundry is located on the first level. The spacious down stairs living area has plenty of seating to lounge around to read, watch TV or just relax. Dining table comfortably seats 6. There is a community gas grill is available steps away at the pool. Large lagoon style pool, hot tub, fitness room and gas BBQ grills are located steps away. This lovely home is well equipped with kitchen items, linens, beach towels and beach gear. At minimum you will have 2 beach chairs, 2 boogie boards, cooler and umbrella. You are welcome to use any additional items in the garage. Pamper yourself with a treatments at the Mauna Lani or Fairmont Orchid spas, oceanside massages. Excellent restaurants eare located throughout the resorts as well as the gourmet market at Foodland Farms. The Shops at Mauna Lani has great local shops and dining. Don’t miss a lunch or dinner at The Mauna Lani Beach Club while enjoying some of the best snorkeling on the island. This is a great property for families!